Winner of the Flannery O—Connor Award, Soos’s first fiction shows talent galore one moment and tries your patience with the familiar and homespun the next. Soos’s eye for detail and his judgment for selecting it can be as good as you—ll find, but his glimpses into people’s daily life aren—t always tonic enough to offset the malaise of the sentimental—as in —When the Hoot Owl Moves Its Nest,— a man’s remembering back to an adultery of his wife’s (—Mostly what people call love is just another word for pain—). More keen-edged but not necessarily less strained is —Nickerson’s Luck,— about a divorced accountant starting an affair with a waitress who may be below him in privilege and class (—Mister, you don—t know what bad luck is—) but proves his superior in wile. 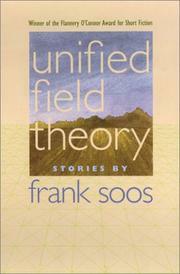 In search of symbols to echo and carry his meaning, Soos can be guilty of leaving psychological believability behind, as in the story of the kindly but hyperbolically weak-willed father in —Ray’s Boat.— —Trip to Sometimes Island— does a good job of encapsulating the life of a car mechanic who—ll never be anything more than he is but knows he’s not enough; and —If You Meet the Buddha by the Road— does the same for a high-school genius (“Two things have made Western Civilization worthwhile: the bicycle and the pocket knife. Otherwise, it’s all been a waste of effort—) who never found his way in life afterward. —Key to the Kingdom— is a fine but familiar dissection of small-town life—with religion, adultery, and suicide—and —Unified Field Theory,— bristling with ambition in the tale of another almost-ne—er-do-well, even so can blend a glibness in among the gems (—Acted on by gravity, electromagnetic fields, solar wind, ether wind, lunar attractions, who among us can claim to be truly responsible for anything that happens?—). Talent at work—but also waiting for new territory.